Last week I was in Portland, OR attending the International Association of Culinary Professionals (IACP) annual conference. It was fantastic. I was provoked, enlightened, and inspired. I was also cold. Unlike San Diego's comfortable 65-75 degree temps, Portland's temps were in the 40's and 50's. Since the sun kept itself hidden, it actually felt like 30's to this perpetually icy-handed foodie. I refused to bring a fleece. I'm from San Diego. We don't do fleece. So I brought my cute new spring coat and froze. I also ate a lot of soup. When a group of us went to Portland's famous food carts, they noshed on bratwurst, grilled cheese, and Korean tacos. I ate soup. When Jeff and I went to a microbrewery, he ordered the elk burger. I ate soup. When we went to Voodoo Doughnuts with my dear friend TW of Culinary Types, I ate doughnuts. Voodoo doesn't sell soup. Like Kramer from Seinfeld, who fell asleep in the broken, 58 degree hot tub, I can't get my core temperature back up. So here I am back in sunny San Diego making soup. This soup is made from the hearts only, the prized part of the artichoke. Once cooked, artichoke hearts are become satisfyingly creamy, making this a luxurious soup. The artichoke hearts' distinctive nutty, earthy flavor is enhanced by fragrant rosemary, tangy Meyer lemon, and rich extra virgin olive oil. I don't need to tell you to eat this with a hunk or two of crusty Italian bread. 1. Fill a medium bowl with water and the juice of 1 lemon. Cut off the stem and rough base of the artichoke and the top two-thirds of the leaves. Snap off the remaining outer leaves. Using a small spoon, scrape out the fuzzy choke. Using a sharp knife, thinly slice the artichoke heart and place in the bowl of lemon water. Repeat with remaining 3 artichokes. 2. In a large stock pot over medium heat, warm olive oil and butter. Add the leek, potatoes, mushrooms, and artichoke slices (after draining and patting dry). Cook for 10 minutes, stirring occasionally. Add white wine and allow to evaporate (about 5-7 minutes). Add the vegetable stock, rosemary, salt, and pepper, and stir until well combined. Raise heat and bring to a boil. Cover partially and simmer for 20-30 minutes, or until the vegetables are tender. 3. Working in batches, puree the soup until smooth. Return it the pot; stir in the half and half (or cream), Meyer lemon juice, salt and pepper. Keep soup warm over a low heat. 4. Meanwhile, in a medium-size dry skillet over medium heat, add 2 ounces of sliced prosciutto. Cook 30 to 60 seconds, or until just crisp. Remove from heat, and slice into small pieces. 5. Ladle the soup into 4 bowls. Top with1/4 of the crispy prosciutto, a drizzle of extra-virgin olive oil, some freshly ground black pepper and a bit of finely chopped fresh rosemary. Serve immediately. Mmmm...glorious! We *just* had the perfect chilly, rainy weather for this, too. When I get cold, soup and tea are the only things that can make me warm again. Although I guess a doughnut wouldn't hurt... This soup sounds delicious! I have some artichokes in my fridge that are SCREAMING to be turned into this. That is a delightful soup! I really like the ingredients you chose! Lovely! Mmmm this looks incredibly delicious and comforting! I'm glad it's still cold enough in Rhode Island to make this soup; and what a great excuse to eat the leaves of the artichokes, to get to those hearts. Oooh yum! I wish I had all the ingredients to make this right now as tonight is the perfect rainy night for a big bowl of soup (with prosciutto)! Susan - the Voodoo doughnuts, and our lovely breakfast with Jeff warmed my heart - no soup needed! Wow, I never knew about the food cart culture in Portland (I just spent some time on the blog you linked checking it out!) How fun! Your artichoke soup sounds delicious! I love a good bowl of soup. Soup would hit the spot here too Susan. It is fitting I think that the word verification below to comment on your blog says "chillebo". Too funny. I love that Seinfeld episode! Thanks for the clever post. You made me giggle. And thanks for the delciious soup recipe. This soup looks gorgeous. And while I love soup I often have a hard time making it for a satisfying dinner unless there's some meat involved. The crispy prosciutto is just the ticket! Do you think we could use frozen artichoke hearts for a quick soup? If so, how many do you think we'd need. They tend to be small. Thanks. I actually love the cold and I love soup anytime. I returned to colder and grayer weather in Boston. I thought we had sunny days in Portland? We're actually at 40 something today. I think I'll try this recipe with what I have on hand: some canned artichoke hearts and some dried porcinis..alas no prosciutto. Great to meet you in Portland! mark-Scorching? That's a word that probably isn't even in their vocabulary! mrsjenb-Good! Now you can stay really warm. ramblingtart-I love those crispy guys too! jessica-Soothes you body and soul. vincent-Thank you for the kind words. I'll check it out. tw-You just warmed my heart. Thank you. cara-Oh, it's fabulous! They're all over the city. missmeatandpotatoes-You sound like me. Once I get cold, I can't warm up. And SoCal can get pretty chilly. Thank goodness for soup! I'm eating some today for lunch. It's cloudy in San Diego! suzan-Sure, I think they'd be fine. I'd go for 8-10 since about 2-3 canned/frozen hearts equals 1 large fresh heart. Let me know how it turns out since I've never made it with them. Bon appetit! jacquelinec-Ha! It's all about perspective. From a San Diegan's pov, that was definitely not sunny. ;) It was great meeting you too. Stay warm! this looks fantastic, and i know what you mean -- when we go somewhere cold, i drink tea nonstop until my body adjusts! Mmmmm, soup! This is lovely, and the prosciutto accent is so classy. The soup looks delicious. I'm sorry the Northwest gave you the cold shoulder. Come back in July. I promise you sunshine and cookies. Those Portland temps don't sound too bad. Back in January, it was below zero here. It's all relative I guess. Soup is a wonderful way to warm up though. The weather has been crazy here in Santa Monica...cold, hot, warm, super windy! 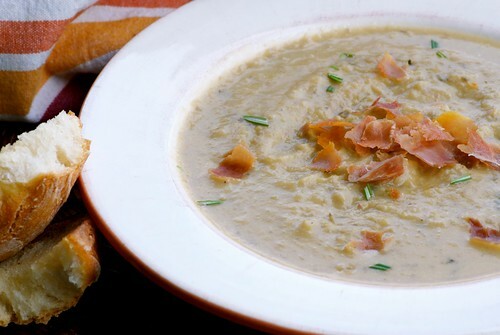 This soup looks amazing, love the crispy prosciutto. It's a great recipe, going to bookmark it. you know what's funny is that i thought the weather was great there. i came back to rain and a few chilly days here in nyc, although it's supposed to become amazingly warm tomorrow. but the whole time i was thinking that it was pretty decent (except when it kept raining on and off on saturday when i was trying to explore). Weather just drives us nuts, doesn't it? This soup looks wonderful! I am always looking for new fun things to do with artichokes, and this sounds excellent! Here in New England it's still chilly too, but I am well into flip-flops and refuse to switch back. So soup is necissary! Thanks! The funny thing is that I just made an artichoke soup, but it was chilled! Your warm version sounds delicious. Hope your core temp is getting back to normal! I hope you did get your temperature up with this! There is a bakery/cafe back in Minneapolis that makes an amaaaaaazing artichoke heart soup that I have tried (and failed) to recreate. Yours sounds a bit different, but still delicious. Tomorrow may not be a soup day, but I'm sure I can fit it in soon! katy-Tea is also a good body warmer. meredith-Nope. Not bad at all. sunita-Rarely? Really? I just love them. lynn-Aw, that's so sweet. I'd love to take you up that. windowontheprairie-Yes, it is relative. Don't forget, I'm a San Diegan now. Anything below 60 is cold. lisa-I hope you enjoy it! I just made this last night - delicious! joanna-So happy to hear it! Thanks! This artichoke soup sounds really satisfying. Soup is my thing, too. I noticed when I recently did an index of my recipes that the Soup category was the biggest one! Have you finally warmed up after IACP? My post-conference fog has lifted, and am systematically going through all my notes. Best IACP conference in a decade, seriously!